Battlesteads Hotel & Restaurant in Wark, near Hexham, is the only hotel in the UK to boast an on-site dark sky observatory – yet another reason why it’s one of the country’s top sustainable tourism destinations. Richard Slade, owner of Battlesteads, explains why making the most of their position on the edge of Northumberland National Park is in their nature. My wife Dee and I love our location in Northumberland and at Battlesteads we do all that we can to celebrate it. Northumberland benefits from being one of the few places in the UK with a Dark Sky Park and it is in fact the largest protected Dark Sky Park in Europe – nearly 1,500 square kilometres of dark skies away from light pollution, that makes for some brilliant stargazing. Northumberland National Park and Kielder Water & Forest Park was designated a Dark Sky Park in 2013 and that got us thinking – how could we make the most of being in this amazing location and how could we share it with our guests? With such a world-class environment for studying the stars on our doorstep it made sense to embrace this and add to the many reasons to visit Battlesteads and the county of Northumberland. That was when we decided to build our own on-site observatory, coinciding with the building of five new eco-lodges to meet increased demand at the hotel. Astro-tourism is a growing market and we felt it would be the perfect complement to our sustainable tourism offer and green ethos. The observatory was designed with the local landscape in mind, to celebrate its beauty rather than detract from it. We used sustainable building materials that helps it to blend in with the local landscape and we even created a wildlife pond as a means of water attenuation, after two successive floods during the build. Our observatory was completed in the spring of 2015 and in the autumn we received the accolade of Dark Sky Discovery Site status, meaning it’s one of the best places in England to see the stars. On a clear night, you can see the Milky Way with the naked eye and there’s no need to travel to Iceland or Norway to see the Northern Lights – you can see them right here from our observatory! The observatory can accommodate up to 25 budding or seasoned astronomers and is equipped with the latest telescopes chosen for their technical prowess and ease of use. These include a Celestron C11 OTA on a EQ8 mount, an enormous set of 25 x 100 mounted binoculars specifically for guests with wheelchairs, plus a range of smaller telescopes targeted at true beginners. Working with our in-house astronomy expert Roy Alexander, we’ve devised a wide range of courses and astronomy sessions suitable for everyone, from complete beginners to experienced stargazers. Throughout the year we host a number of special events such as Shooting Star Suppers, meteor shower viewings and introductions to Astrophotography and nature photography, as well as regular ‘Get To Know Your Telescope’ sessions and aurora hunting evenings. We encourage our hotel guests to visit the observatory and see this different side to Northumberland as part of their stay. The feedback we’ve had has been fantastic and our guests really enjoy having the opportunity to learn more about stargazing just a few steps away from their accommodation. 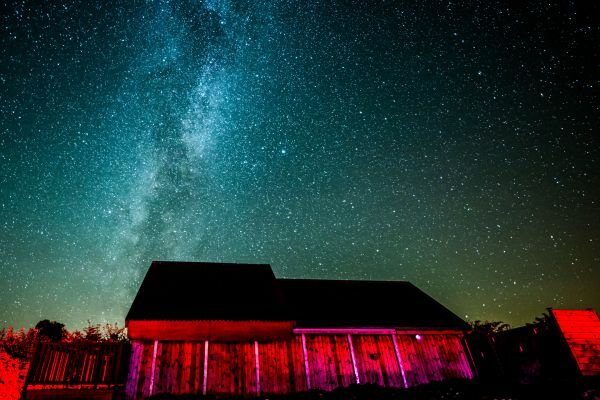 The dark sky observatory is the perfect addition to Battlesteads’ sustainable tourism offering and it gives us great pleasure to be able to show our guests why Northumberland’s Dark Sky Park is so special. Courses at our observatory are priced starting at £20 per person and overnight accommodation starts from £60 per person per night for bed and breakfast based on two people sharing. For more information about Battlesteads Hotel and Restaurant and our observatory visit www.battlesteads.com. An accessible, public astronomical observatory offering talks, activities, drop in sessions, stargazing and Astro courses to suit anyone from the absolute beginner to the professional. An award winning homely 3 star hotel and Restaurant near Hexham with a secret walled garden, beautifully sunny conservatory, cosy wood burning fireplace and inviting accommodation.